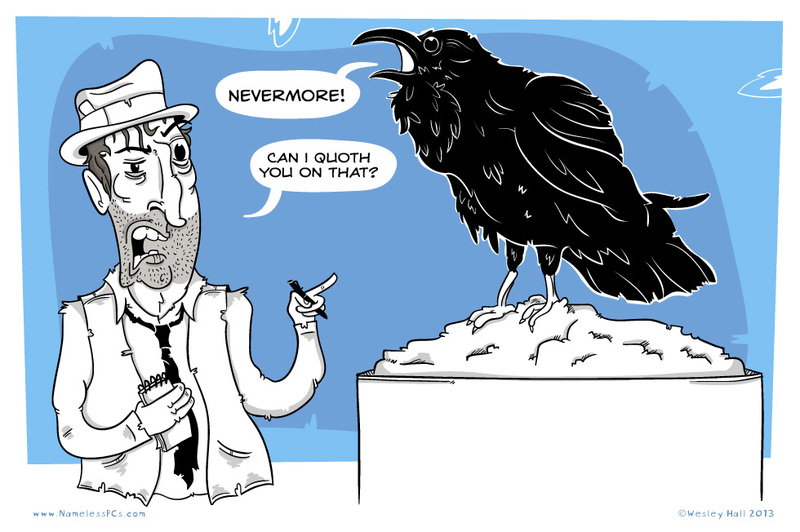 It’s October, now is the time for prepping for Halloween and the other fall holidays, so with that I give you this small comic dedicated to Edgar Allan Poe and one creepy bird. Enjoy! Since it doesn’t look like a bust of Pallas Athena he’s sitting on, does that mean it is a giant container of raven poo? Just wonderin’. One could interpret it as such, or it could also be a large fake rock in a museum that has a preset recording in it to play the phrase “Nevermore” every couple of minutes and to throughly confused time traveling news reporters who drink to cope with the life they lost to time travel. It’s open-ended.